"The World Burns" token, awarded by fgiunchedi. fgiunchedi added a subscriber: Marostegui. Please replace the remaining hardware sent. I found the hardware below out of date. Create another Support Assist form the IDRAC to review. If no failures seen put the removed CPU in the CPU 2 slot and the DIMM in the B1 and B2 slot. Reboot and check status. Run another Support Assist if failures still seen. Did all the dell engineer recommended above. Waiting to proceed to step 10 . Replaced all the parts that was shipped to me by Dell (main board, RAID controller, RAID controller interposer board.SAS cable) swapped CPU1 with CPU2 we have the same problem on the server. I email Dell last Friday, waiting for Dell to get back in touch with me. Can you clear the log from the IDRAC, boot into the Life Cycle controller and run diagnostics. I need this to provide to my team lead for review. 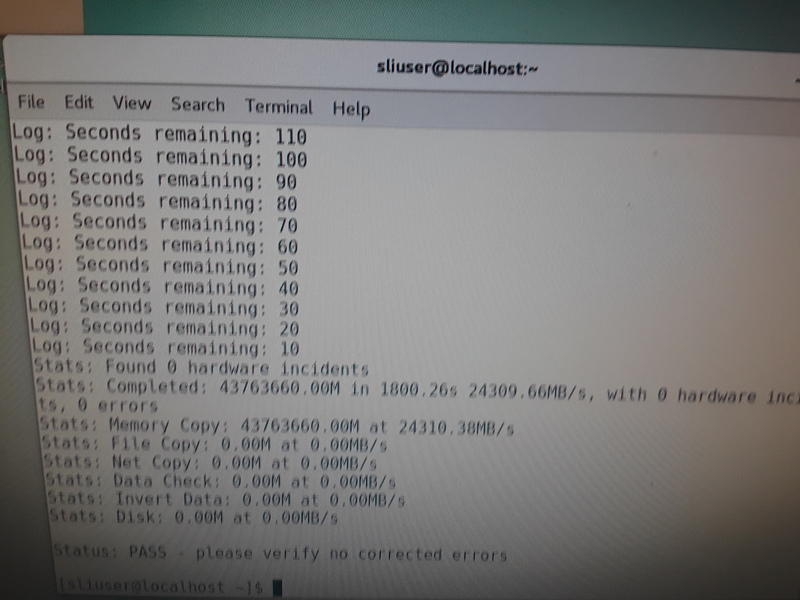 After 16 hours of hardware diagnostics, the server came up with no error. I have a Call schedule with Dell in 2 hours to discuss about the next step to take. Papual, while you are trying a different power source, my Linux software support would like to review the OS logs to make sure we have covered all possible causes. They are requesting the MCE and syslog’s for review if available. My work schedule is 7:00 am - 4:00 pm, Monday through Friday CST. mobrovac mentioned this in T211319: Degraded RAID on ms-be2047. mobrovac mentioned this in T211318: Degraded RAID on ms-be2047. mobrovac mentioned this in T211317: Degraded RAID on ms-be2047. mobrovac mentioned this in T211316: Degraded RAID on ms-be2047. mobrovac mentioned this in T211315: Degraded RAID on ms-be2047. mobrovac mentioned this in T211313: Degraded RAID on ms-be2047. mobrovac mentioned this in T211311: Degraded RAID on ms-be2047. mobrovac mentioned this in T211310: Degraded RAID on ms-be2047. mobrovac mentioned this in T211309: Degraded RAID on ms-be2047. mobrovac mentioned this in T211308: Degraded RAID on ms-be2047. mobrovac mentioned this in T211307: Degraded RAID on ms-be2047. mobrovac mentioned this in T211304: Degraded RAID on ms-be2047. mobrovac mentioned this in T211303: Degraded RAID on ms-be2047. mobrovac mentioned this in T211301: Degraded RAID on ms-be2047. mobrovac mentioned this in T211300: Degraded RAID on ms-be2047. mobrovac mentioned this in T211299: Degraded RAID on ms-be2047. mobrovac mentioned this in T211298: Degraded RAID on ms-be2047. mobrovac mentioned this in T211296: Degraded RAID on ms-be2047. mobrovac mentioned this in T211295: Degraded RAID on ms-be2047. mobrovac mentioned this in T211293: Degraded RAID on ms-be2047. mobrovac mentioned this in T211292: Degraded RAID on ms-be2047. mobrovac mentioned this in T211291: Degraded RAID on ms-be2047. mobrovac mentioned this in T211290: Degraded RAID on ms-be2047. mobrovac mentioned this in T211289: Degraded RAID on ms-be2047. mobrovac mentioned this in T211288: Degraded RAID on ms-be2047. mobrovac mentioned this in T211287: Degraded RAID on ms-be2047. mobrovac mentioned this in T211286: Degraded RAID on ms-be2047. mobrovac mentioned this in T211285: Degraded RAID on ms-be2047. mobrovac mentioned this in T211283: Degraded RAID on ms-be2047. mobrovac mentioned this in T211284: Degraded RAID on ms-be2047. mobrovac mentioned this in T211282: Degraded RAID on ms-be2047. mobrovac mentioned this in T211281: Degraded RAID on ms-be2047. mobrovac mentioned this in T211279: Degraded RAID on ms-be2047. mobrovac mentioned this in T211278: Degraded RAID on ms-be2047. @Papaul @fgiunchedi Today the RAID alarm was continuously flapping and created a ton of tasks (see above) that I asked mo.brovac to close as he had access to the batch edit interface in Phabricator. I've disabled the event handler for the 2 RAID checks in Icinga for this host. Please remember to re-enable them once fixed. FYI At this time I cannot SSH and from the console I get the login screen but after entering root as user it doesn't ask me for a password and gets stuck there. Here is a link to the Dell Support Live Image (SLI) Version 3.0. with this we can test the hardware outside of the OS to see if it reboots. Download SLI30_A00 and burn it into a DVD or Pendrive as bootable or mount it to iDRAC virtual DVD using iDRAC virtual media option. Connect the DVD or Pendrive on physical server or if booting through iDRAC, map the iso image using iDRAC virtual media. For DRAC based machines - 9G and 10G, you can mount Support Live Image on DRAC virtual console from DRAC GUI and for iDRAC, you can mount Support Live Image on Virtual Media option present in Virtual Console. Stress test on the system cam out with no errors. I talked with @fgiunchedi on IRC to re-image the server with a fresh install and go from there. Fresh OS installed on the system. Leaving the system up again to see. Given that the other hosts in this batch are fine and we've replaced the parts Dell wanted to replace what's the next step? fgiunchedi mentioned this in T209395: rack/setup/install new ms-be servers ms-be204[4-9] ,ms-be2050. Dell will be shipping 1 New CPU by Monday. CPU 1 has been replaced. I clear also the log. The system is back up and I will be monitoring it once again. The host started sending cron spam about an hour ago. They were all from F ile "/usr/bin/swift-recon-cron", in in which " AttributeError: cffi library '_openssl' has no function, constant or global variable named 'sk_H509_NAME]ENTRY_value'". That sounds unrelated to this hardware issue but just started randomly an hour ago and kept sending mail. Since this host is broken and not in production anyways, i scheduled a downtime in Icinga for one month and Papaul shut the host down. While there's no OpenSSL symbol sk_H509_NAME]ENTRY_value, there is a sk_X509_NAME_ENTRY_value. Also, ASCII H (0x48) and X (0x58), as well as ] (0x5D) and _ (0x5F), are each a single flipped bit from each other. Dell just called me. They will be shipping a new system and will arrive by the first week on January. fgiunchedi added a subscriber: GTirloni. @fgiunchedi I replaced the problematic server with the new one Dell shipped to me. The OS is installed and puppet first run done. I will proceed to the disk wipe on the old server on Wednesday before shipping it back to Dell. Let me know if you have any questions. Thanks Papaul, I'll stress-test the host and put it in service if no problems arise. Old server has been shipped out. Shipping information below. Previous hardware has been already returned since last Thursday. (See comment on Feb7) We can resolve this task.